i like this hanger for a mud or vestibule room, or maybe even a bathroom. they’re made from naturally tumbled sea stones taken from the shores of new hampshire, and they come double, triple or quadruple stoned (really that does not sound right!). each hook features copper hardware, dark or light hardwood back, and large, smooth stones that won’t cause snagging or misshaping. the materials are sustainable – for each stone “harvested” another rough quarry stone is “planted” in its place; for each tree used for the backs, ten times the number of trees are planted. chances are you could make a very nice diy version similar to this rack. i know that i think this because i just saw that lovely sea urchin mobile at swallowfield. isn’t it pretty? anyway, if anyone has or does make a beautiful rocky wall hook, please let me know! not only are the stone wall hooks simple and beautiful, i imagine they would be kinder to the clothing hung on them than the conventional fabric-poking hooks. nice find! 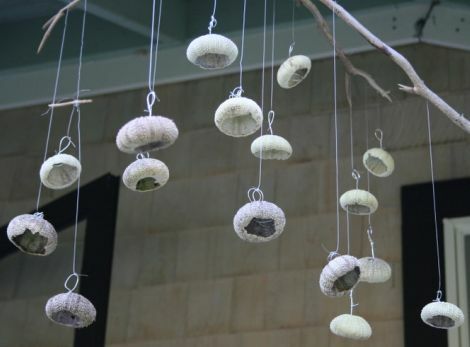 I really like that urchin mobile, so beautiful, great weekend project! thanks for your comment! yes, i agree — the stones aren’t pokey like regular hooks. And they look like they’re as tall as the wood base behind them, which is 5″, so they can handle heavy winter coats with ease. i LOVE that mobile too. it is such a creative way to bring back coastal maine vacation memories!